Celebrating Easter traditions from my childhood with my kids is something I look forward to every year. While I do let them indulge in a small amount of chocolate I try to a keep it to a minimum because a sugar hyped toddler is no fun for anyone. Happily, there’s lots of fun to be found in our chocolate-free Easter gift guide for the little bunny in your life. Limiting chocolate at Easter doesn’t mean your little one has to miss out on all the fun. You can still keep traditions alive, like the famous egg hunt with these very cool Glitter Gold Eggs (pictured above). 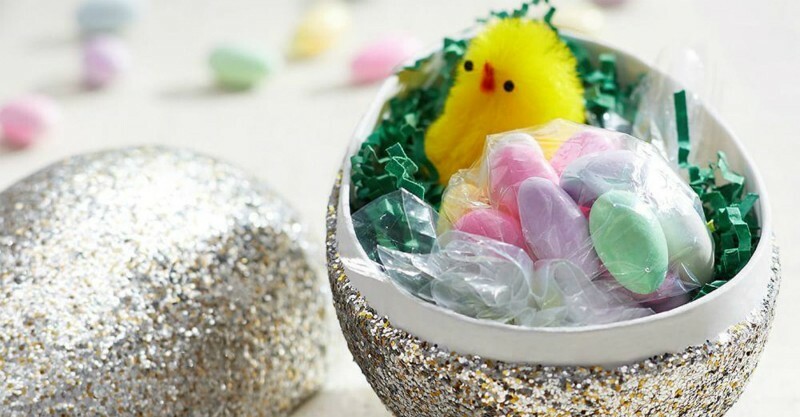 The oversized eggs are the perfect place to hide a chocolate free surprise, you can order them online for $14 from Pottery Barn Kids. Of course, the very best egg hunts are done when the kids are still in their pjs, so Easter themed pyjamas are a must. 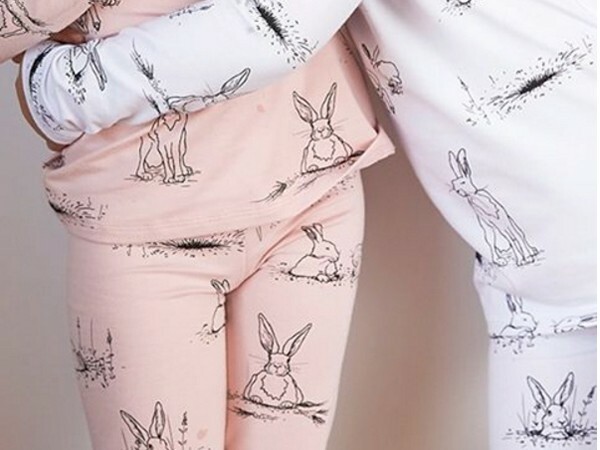 We love these bunny long johns from G Nancy. They start in toddler sizes and go right up to fit big brothers and sisters too for some Easter matchy-matchy fun. Find them any day now over at G Nancy. I’m going to take a guess and say that the toddler in your life will love this very cute Jack-in-the-box starring the adorable Little Nut Brown Hare as much as they would chocolate. You and your tot can bop along to the classic tune “Pop Goes the Weasel” as you wind the handle and wait for that adorable Little Nut Brown Hare from Guess How Much I Love You to surprise you. Priced at $40 from Baby Vegas. If you have a toddler who isn’t a fan of their peas being mixed in with their corn and likes everything in its right place then the Beatrix Potter Nursery Feeding Set will make the perfect Easter gift. 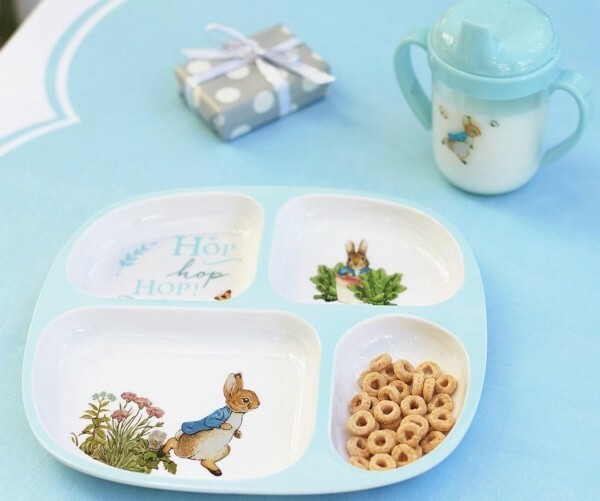 The set includes a divider plate and sippy cup both featuring the forever charming Peter Rabbit. Both are dishwasher safe, shatterproof and easy to clean as well as BPA and phthalate-free. Add a touch of timeless charm to meal times this Easter for $44 from Pottery Barn Kids. Stacking, grouping and sorting is a phase all toddlers seem to go through. 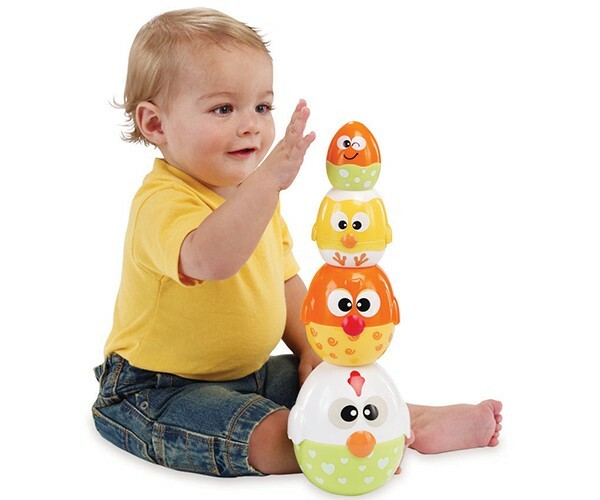 My little boy could sit and stack things all day which is why I love this very cute Chicken and Egg Stacker from International Playthings. The four cute and colourful little chicks are great for stacking and nesting all while perfecting their fine motor skills. Available from local stockist Toy Universe for $17. Encourage your little one’s creative side with some Easter egg shaped crayons. 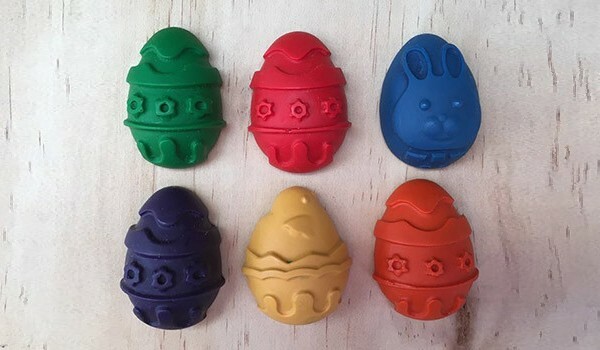 These adorable eco friendly Easter egg crayons are Australian made with organic beeswax and plant waxes. If they end up in your tot’s mouth you won’t have to worry, they are free from paraffin, palm, soy, heavy metals, asbestos and other toxic substances. Order from Eco Toys for $16. 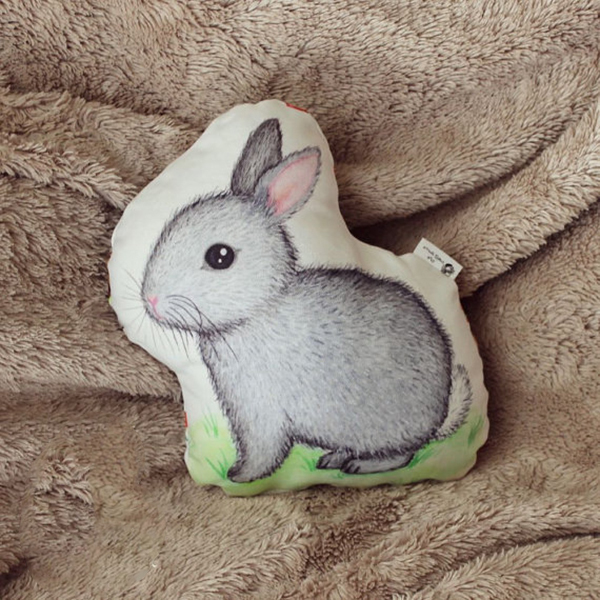 You can never have too many pillows, especially when they are sweet as this delightful bunny pillow from Etsy store Marta Dalloul. The handmade pillow will have your tot smiling from ear to ear, while the fact that it’s machine washable will leave you smiling too. Not only will this pillow make for some sweet bed decor but also makes a great cuddle buddy for your child. Priced at $33 , find it at MartaDalloul. Now, even if you don’t feed your toddler any Easter chocolate, you can bet the grandparents will sneak them some. So add a Jack N’ Jill Bio Bunny Toothbrush to their Easter basket. It has soft rounded nylon bristles for gentle cleaning, an ergonomic handle that’s just the right size for little hands and is made from 100 per cent corn starch. You can pick one up direct from Jack N’ Jill for $4.95. 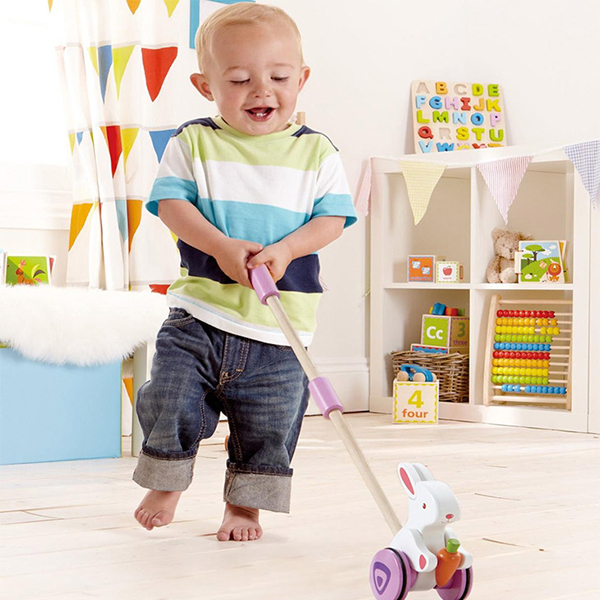 If your toddler is anything like mine then they will love Hape’s Pull Pal Bunny. The lovely push along toy will keep them busy and delighted. Find one at Mighty Ape for $25. Your kids won’t be scared of the dark anymore, with the Rex Baby Bunny Nightlight. 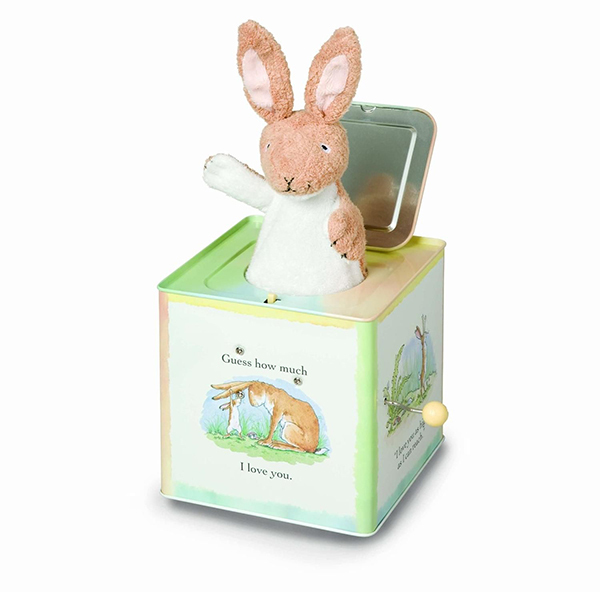 The quaint little bunny will bring a comforting glow into your little one’s room, helping them drift off to sleep. The battery powered nightlight is a steal at $8.50 at ASOS. Bunnies plus babies make for a cuteness overload just like the sweet collection of bunny themed clothing from Seed. Their adorable Bunny Pinafore Knit($50), paired with their delightful Bunny Yardage Tee($25) will make a great outfit for Easter day. If a bunny on a waddling toddler doesn’t make you melt then nothing will and we love these Bunny Bum Print Pants($35). Shop online at Seed for the cutest bunny attire for the little bunny in your life. We hope you and your little babe’s have a lovely Easter full of family fun. Be sure to check out our other Easter gift guides for more chocolate free ideas for babies and bigger kids.